Most readers here enjoy starting at maps. 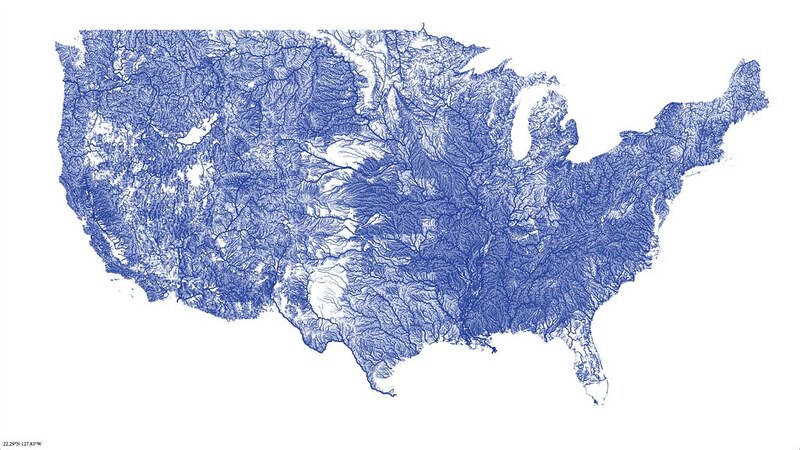 The above visual rendering of the rivers in the lower 48 is a good one for nostalgia, and the general aesthetic value of fact. A massive, scrollable version can be found here. Discussion of the technical aspects of the image-map, which is beyond me, can be found here. I did an exceptionally useful mod to my Gossamer Gear Gorilla, which much improves its weight transfer for those occasions where you might be carrying well over 30 pounds. An article of mine on minimalist footwear for shoulder season backpacking just went up on Toe Salad, which is a somewhat gross name for a good website on shoe-geekery. Not anything I haven’t written before, but a short summation of all my ideas on the subject. I also wrote an account of how the Bob Open came to be for Gossamer Gear. Lastly, in preparation for the fast-approaching elk and deer season, I painted the stocks of both my Remington 700 and our new Handi rifle. Both were boring black plastic and needed a more inspiring presentation. Aluma Hyde II in OD green got the job done. A nice matte finish. Aluma Hyde isn’t primarily meant for plastic, and thus the aggressive heat setting which most sources seem to recommend (i.e. baking in an oven for a few hours) is not appropriate. I followed the factory directions, cleaning thoroughly and doing a series of thin coats with brief heat application between each. We don’t own a heat gun or hair dryer, so I waved a lit MSR Pocket Rocket under each item for a minute or two as they hunt suspended on wires in our open garage. This worked well. To finish things off, and avoid the weeks long air cure Aluma Hyde entails, I suspended the items in front of our open oven, with the oven set on 200. Using the bits of wire left over from painting, I hung the stocks from the handles of skillets on the range. A kettle full of water worked as a counterweight. A few hours, and another week of curing in the safe after assembly, did the trick. Aesthetic only, but I like it. As they say, there are many others like them, but these rifles are mine. The Remington is a stock SPS in .30-06, with a 3×9 Leupold, and a prefit Pachmyr recoil pad (which also lengthened the LOP a bit). At 8 pounds all up, it’s the elk gun. The H&R is a compact .243, to which we added an aftermarket adult-sized buttstock. The result is a nice compact 20 inch barrel and factory iron sights. It’s the deer gun. Dave, what’s the weight on the .243? Around 5 and 3/4 lb without an optic or mounts. Looks good Tom! I take it you used Krylon or something comparable? That Remington and scope are identical to the one in our safe except caliber is 7mm Mag. I hear .243 is a great deer cartridge. Got out Saturday to make sure the Rem is still zero’d for elk season next month. Dead on. It fits a lot better after adding the Decelerator which added ~.3″ to the LOP.